Mud Duck Productions' follow up title to 2002's All Star Racing changes focus from classic, stock and super cars to Truck, Kart, Grand Prix (open wheel) and Motorbike racing. Each type of vehicle in All Star Racing 2 features changeable color schemes and five tracks, and players can select from multiple viewpoints and three levels of difficulty. Five race lengths are offered (user's choice), beginning with three-lap sprints and increasing by increments of three, culminating in 15-lap endurance contests. 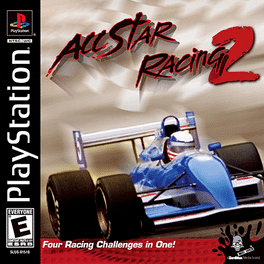 All Star Racing 2 is Mud Duck Productions' follow up title to the 2002 title, All Star Racing. While the first game focuses on stock, classic and super cars, this title features open wheel, truck, sport bike, and kart racing.